Social media ROI is no different. What’s the value of a Like? How much return do you get from a Retweet? These are the types of questions that often come up when you’re trying to figure out how social pays off for your business. However, those questions don’t speak to the true value of social. In order to figure out the real value of social media in your organization, you have to think as much about relational as you do about transactional. It’s not that a transactional approach to social media ROI is completely irrelevant. It’s very relevant. However, a lot of the value from social doesn’t show up immediately. For instance, a prospect you shared an article with on Twitter may come back and purchase from you three months later because they bookmarked your content. And if they clicked on a Google Ad, credit will be given to Google, even though social contributed to the conversion. A user clicks a link in your Tweet, then makes a purchase. You build familiarity with a user through sharing multiple valuable social media posts. Over time they grow to know, like and trust you. Eventually, they might make a purchase. Or they share your content with a friend that makes a purchase. Or something you share gets picked up by an authority who sees it, shares it with their followers and you get exposure to a new audience. The point is, social media ROI isn’t as cut and dry as you might think. The direct link between social media and a new customer might not always be as direct as a Google Adwords or media buying campaign. But the return you get from Facebook, Twitter, Instagram and other networks can be just as great, if not better than “traditional” marketing channels. When you talk about the value of social media, you need to consider the value it brings to other aspects of your company as well. Whether it’s learning more about your target audience so you can better serve them, building awareness for your brand or retaining existing customers, social media now has a hand in nearly every part of your business that involves customers. The problem is some marketers aren’t sure how or where to start when it comes to proving the value of social. We think we can help with that. With over 31% of all traffic now coming from social media, brands need to start making it a priority. Just three years ago, social only drove 22% of all traffic. The takeaway here is consumers rely on social media to find content more than ever before. It’s representative of the way people consume information today vs 15 years ago. 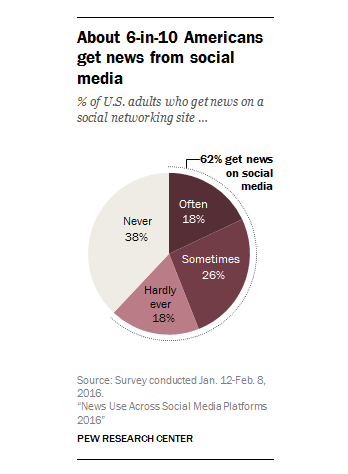 In a world where 62% of people get their their news from social media, your brand can’t afford to be nonexistent on Twitter, Facebook and other networks. Social continues to prove it’s one of the most valuable traffic generators. Plus, one of the biggest advantages of driving traffic from social as opposed to other sources is the branding and awareness benefits you get along with it. When people find your site through search or a paid ad, they may collect the information they want and completely forget about you. On social media, people can start following you with the tap of a button, which delivers long-term benefits and opportunities to re-engage with them again and again. Once you’re able to get someone to follow your brand, you continue to share content with them on a regular basis. Instead of hoping and waiting for prospects or consumers to visit your website when they’re ready to buy, your brand will already be top of mind. And to add to this, social media traffic becomes increasingly valuable over time. As your audience becomes more familiar with your brand, they’ll grow to trust you and be more inclined to purchase your offerings. Social media is a way to introduce people to your brand and nurture them through providing helpful and educational content. Every article you share on Twitter, Facebook or LinkedIn from Sprout is automatically tracked. This allows you to see exactly where your traffic comes from when people click your links. It’s also broken down per network. You can access this report by connecting your Google Analytics account directly to our app. Measure your improvements in social traffic over time and see how it corresponds with your business growth. 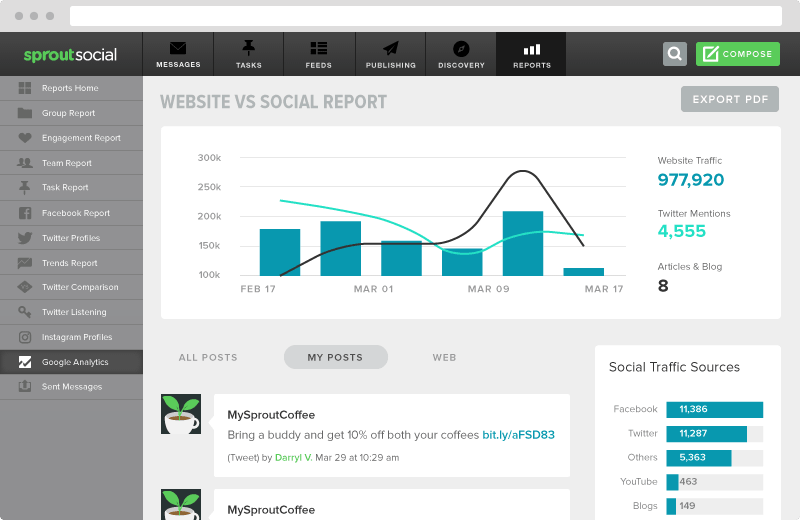 You can use Sprout to generate reports and share learnings with others on your team. Social media is an excellent way to build awareness for your brand. With millions of active users spread across Facebook, Twitter, Instagram and other networks, the reach you get on social is amazing—and it’s more credible coming from a trusted source. That makes it the perfect platform to tell your brand story, which is a major driver of how consumers buy today. People don’t just want to buy from companies because they have good products and services. They want to know what your brand stands for in addition to what it sells. In fact, 66% of consumers are willing to pay more for products and services from companies dedicated to social and environmental good. Use social media to let people peek behind the curtain to understand more about your company, your culture and what you stand for. It doesn’t have to be a social cause, but people want to know who they’re buying from. For instance, WeWork places a priority on empowering entrepreneurs and creatives, as well as making their co-working spaces a part of the community. They’re able to use Instagram to showcase their brand beliefs and messaging authentically, which in turn attracts customers who share similar beliefs. Plus, social media is where people tell their friends about their favorite products and brands. Two-thirds of Americans say they’re more likely to purchase a product after a friend or family member shared it on social media. So needless to say, it’s a great way to build awareness. But how do you track it? Start by identifying some keywords associated with your brand. This could be your company name, a branded hashtag or names of original products you sell. Make sure you’re only using keywords and phrases specifically associated with your brand. For instance, Best Buy probably wouldn’t want to track “Dell keyboards” since it’s a phrase associated with other brands and companies. But Geek Squad is a branded term people are most likely using to refer to their brand, so that makes more sense for them to track. 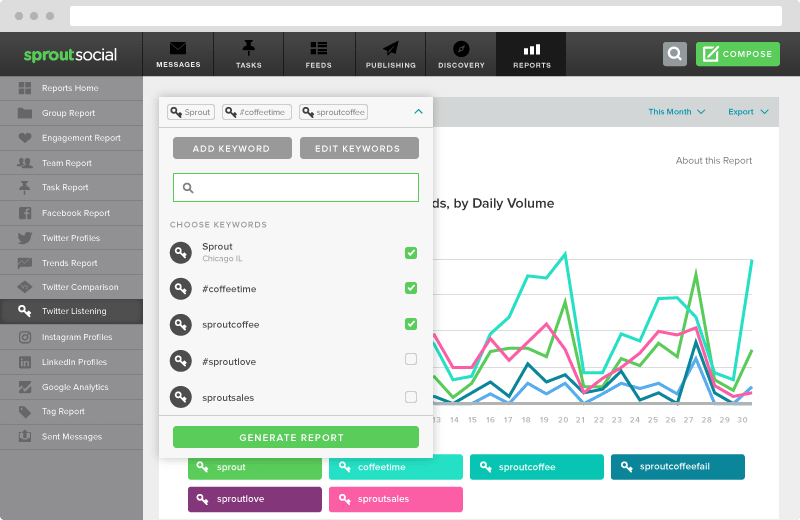 Then, you can add these specific keywords into Sprout’s Twitter Keyword Report to start tracking. 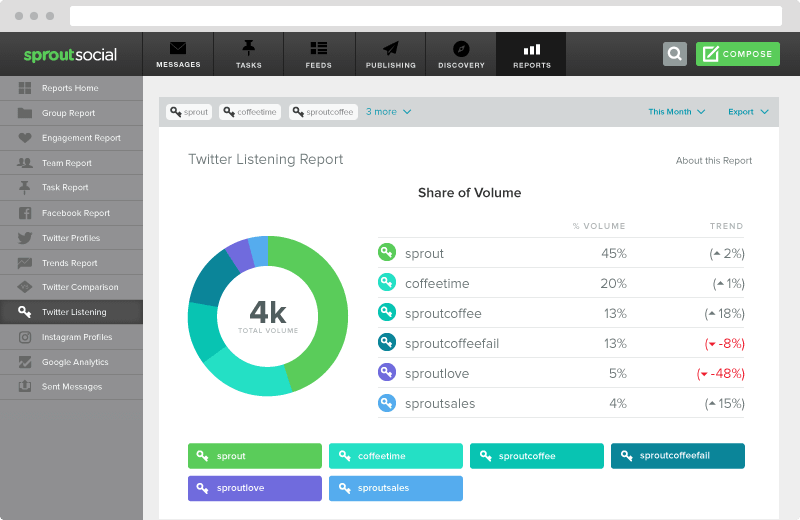 Sprout’s social media listening tools will allow you to see your brand’s share of voice for each keyword so you can track your growth over time. A great tactic you can use to get a clearer picture of how your brand is growing on social is to create a branded hashtag. For instance, Nike promotes the #justdoit hashtag on Twitter and Instagram. They can monitor the usage of that hashtag from other users to get an idea of how much the awareness for their brand is growing. This is also helpful on a campaign level. When you’re launching a new product, you’re likely doing a lot of promotion on various channels like radio, media outreach, digital advertising and others. If you have a branded hashtag to go along with your efforts, you can use social media to gauge the general census of your audience. Remember, people consume information and content from various channels, but social media is where they go to talk about it. Few brands take advantage of this approach better than Netflix. The video streaming company often creates branded hashtags when promoting a new series or movie being added to their platform. The hashtags help grow buzz and build anticipation for new releases. In turn, that leads to word of mouth advertising, media pickups and mentions from influencers. So not only does social make it easier to create multi-channel campaigns, but it also helps gauge the success of campaigns that involve various channels. We talked about how beneficial social media can be for driving traffic to your website. But once people arrive, the value starts to kick in even more because social media followers aren’t afraid to buy. In fact, our Q3 2016 Index report found that 57% of users are more likely to buy from a brand they follow on social media. Start focusing on building a highly engaged audience on social media first, and profits are more likely to follow. 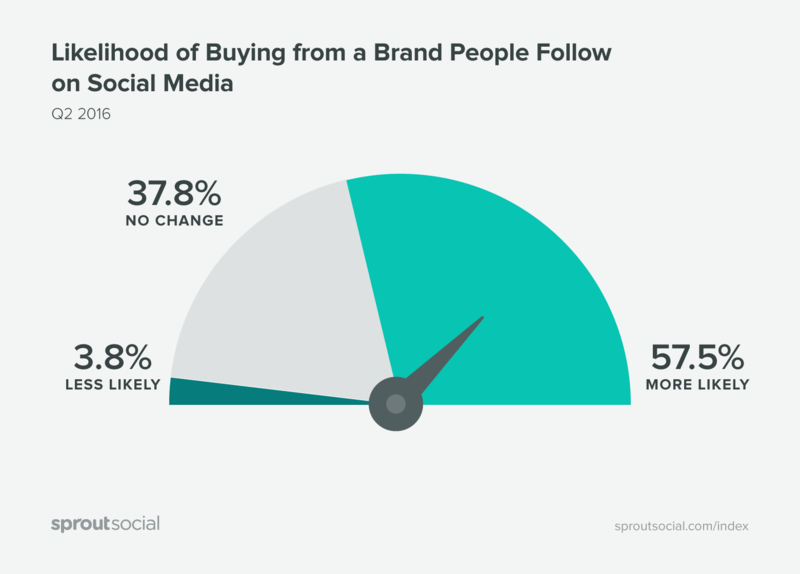 Not only are your social media followers more likely to buy, but they may also spend more. J.Crew found that their social media followers spend twice as much as their average customer. There’s a common misconception that it’s impossible to tie social media to revenue. However, with proper tracking and attribution, it’s very much possible. We at Sprout Social created an entire guide on how to do it, which you can find here. What if there was a way for you to see exactly what your target audience or existing customers wanted from your brand? Not only that, but to also learn about what else they like outside of just the products and services you sell. How valuable would that information be to you? Very, right? You can get this information and more from social media. Your customers are constantly Tweeting about experiences they’ve had with your business and posting photos on Instagram with their favorite products. Our Q2 2016 Index found that social media was consumers’ No. 1 choice for seeking customer service. That’s right–your customers are using social media to talk directly to you, to resolve problems and create great experiences. We’ve also seen an uptick in the number of people using social media to contact brands. 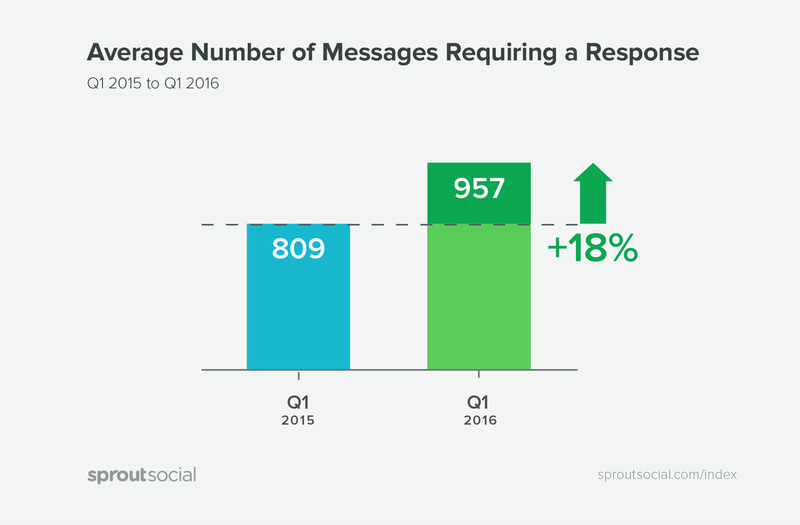 Our data showed the number of messages sent to brands that require a response increased 18% between 2015-2016. That makes social the perfect platform to not only gain customers, but to retain existing customers. When marketers think about the value of social media, they generally think in terms of acquiring new customers. However, consider the value in keeping your existing customers vs the cost of acquiring new customers. However, you need to beware. Before the days of social media, when customers were dissatisfied with your company they just stopped buying from you or told a neighbor. A select few might leave negative feedback on Yelp or other review sites, or attempt to reach out to explain what they don’t like about your company. But for the most part, you didn’t feel the consequences of a dissatisfied customer. However, now consumers turn to social media to voice their issues before they officially close the door on doing business with you. That means you get a chance to make things right before losing a customer. And since it costs anywhere from five to 25 times as much to gain a new customer as it does to retain an existing one, it’s well worth your time to reply to Tweets and Facebook posts from dissatisfied customers. Just as social media can be used to amplify your brand message, it can have the same effect on the negative experiences customers have with your company. When someone Tweets or posts a Facebook rant about how dissatisfied they are with your brand, it’s no longer private. They’re sharing that information with all their friends, family members and potentially anyone else online who sees it. One bad situation can easily turn into a PR nightmare. When your goal with social is to retain customers, one important metric to pay attention to is engagement. 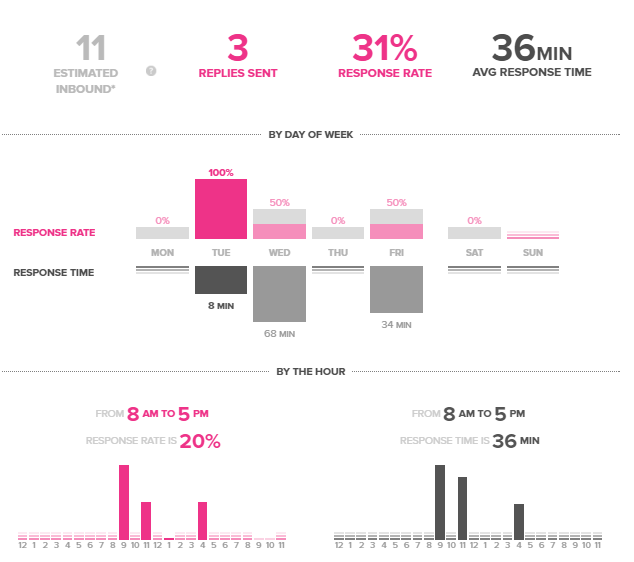 More specifically, you need to consider and track your average response rate (how many messages you receive that you actually respond to) and time (how long it takes your business to return a message received by a customer). 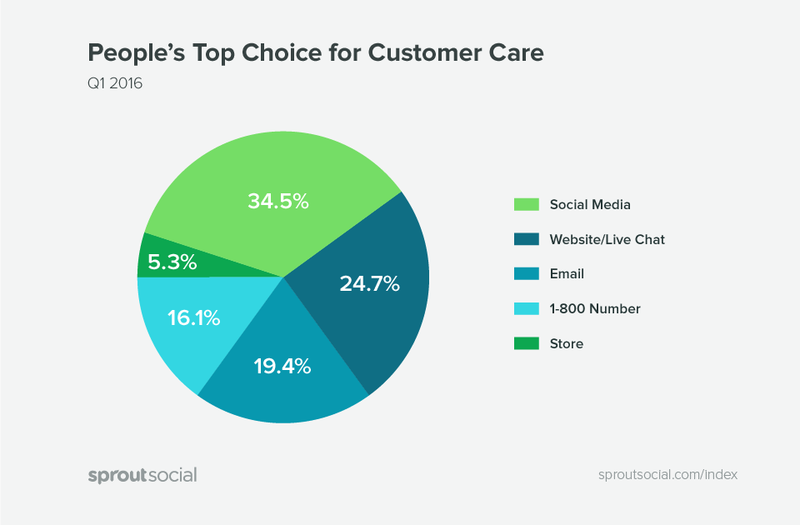 Both of these numbers can be tracked within Sprout’s Engagement Report. 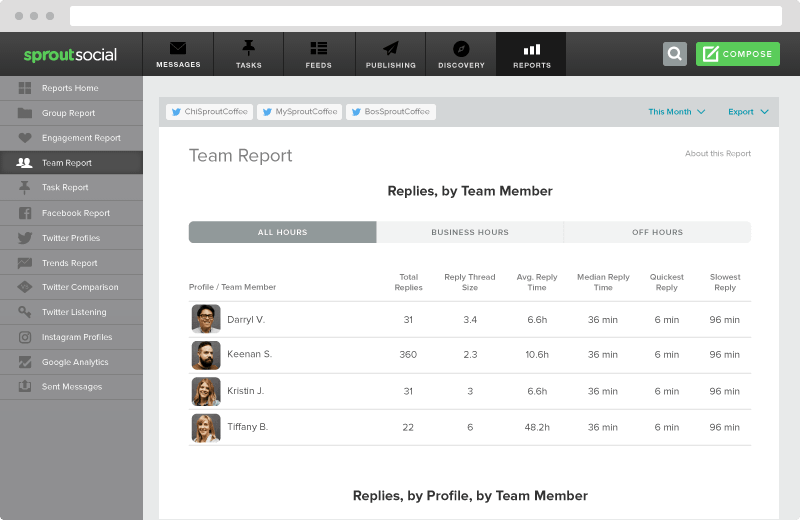 If you have multiple people handling your replies on social, you can see their response time individually with our team report. Slow response times or ignoring incoming messages altogether can lead to lost business. 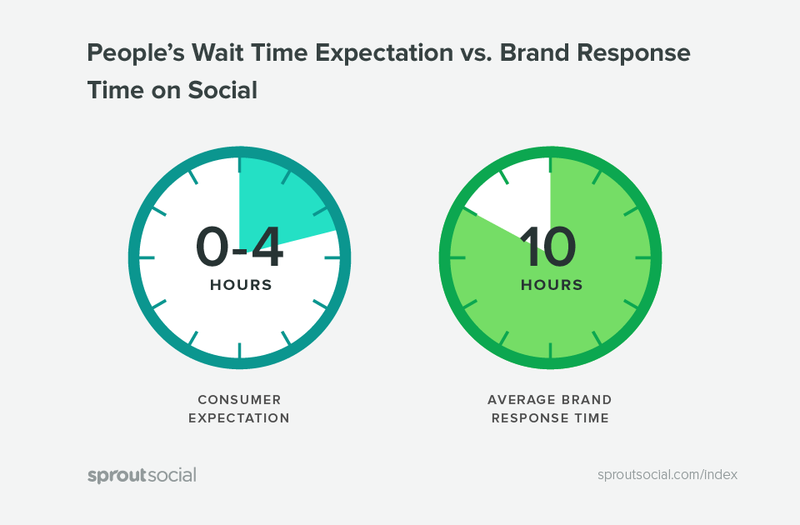 We found that while customers expect a response from brands within four hours, it takes companies an average of 10 hours to reply. 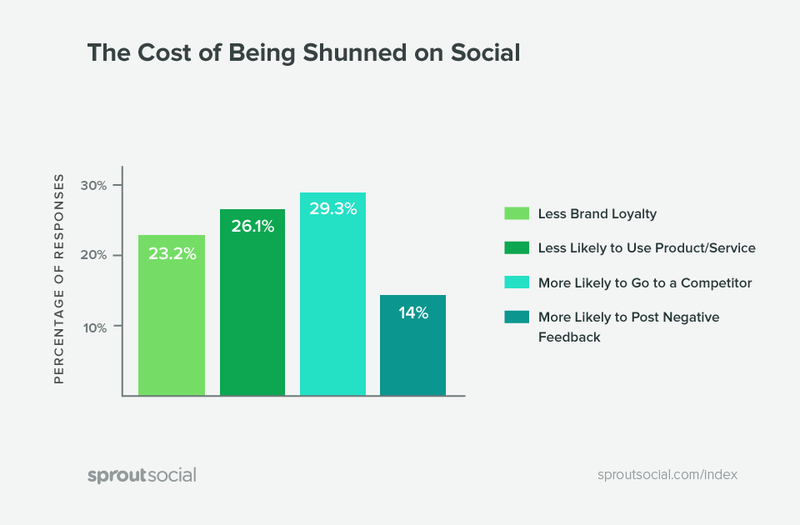 Here’s the biggest reason brands need to reply on social media. Nearly 30% of consumers whose messages to brands go ignored are more likely to switch to a competitor. The value of social media doesn’t have to be an elusive mystery your brand struggles to solve. Shift the way you think about how social benefits your company from a transactional viewpoint to more relational. You’ll get a much clearer picture of what social media ROI means to your brand and how to measure it.